and could view all artists studios in there as well. I keep badgering people to send me images to put on the website, so it's nice to see a couple of new ones from Gill Place. 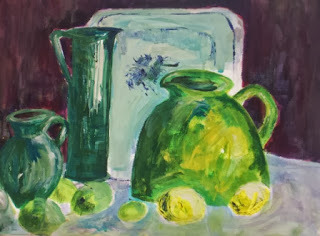 Thanks for sending them Gill, I love the colours in these, especially the still life. I don't know how many people are aware of the 'Discover Middlesbrough Festival', which takes place in the last couple of weeks of October. It includes quite a lot of art related events including new William Tillier exhibitions at MIMA and the Platform A Gallery, together with a talk on Fri 25th. The Dorman Museum is having a 'Pencil and Paper' Exhibition running until Jan 26th. Dundas House hosts the Navigator North Spen Studios on Saturday 19th and there are more open studios and exhibitions at Gilkes Street Artists and Platform Arts on Sat 26th. In September the group hired the Fisherman's Institute at Runswick Bay for two intensive painting days, which proved to be enjoyable and productive for those who attended, especially as the weather was beautiful.. Hopoefully, more information and pictures will follow.